One of the leading choices in outdoor furniture, aluminum is a superb option for patio furniture due to its portability, durability and beauty. Aluminum will last for years, allowing you to get the most out of your money.Many designs are available because cast aluminum is made using the process of pouring melted aluminum into molds. The many benefits of cast aluminum furniture include: Cast aluminum won’t rust, allowing it to be used in any climate. The material is lightweight, allowing you to easily move it for seating arrangements. Due to how the furniture is created, many designs are available, tending to every culture around the world. 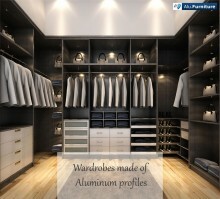 Aluminum Furnitures; Aluminum Profiles to Make Furnitures, Wardrobes, Kitchen Cabinets, Bathroom Cabinets. Shenghai Aluminum is a trusted partner and producer of aluminum solutions for any need based in China. As a leading profile manufacturer, we provide a full range of products including aluminium furniture fittings. Our production services encompass all stages from metal cutting to the assembly of entire aluminum construction groups. Shenghai Aluminum furniture profiles are modern solutions for kitchen, living room, children’s room, and bathroom. Thanks to our high-performance machinery, we can make any aluminum front for furniture. Along with furniture solutions, we also produce wardrobe door aluminium profiles with an ergonomic design to protect the edges. With our wardrobe extrusions, you’ll be able to produce any wardrobes since our products provide you with unlimited possibilities for modern design solutions. Our furniture extrusions are made of aluminum alloy 6063-T6/6061-T5 meeting China Nation Standards as well as other quality requirements. The quality of each profile is ensured by using equipment with high processing precision. Our workers are fully-trained to produce the aluminum products. According to your particular requirements, we can provide drilling and milling for hinges, fastenings, and detents. Only top-quality products at the reasonable prices for all our partners.